Just over St Catherine’s Hill, beyond the River Itchen traffic flashes by bound for who knows where on the noisome, noisy M3, but less than a mile away it’s barely audible. Indeed, all that motorised mayhem seems a very long way from the gently ordered serenity of the Hospital of St Cross and Almshouse of Noble Poverty. Founded in 1132 (probably), it is widely considered to be Britain’s oldest charitable institution and continues to provide accommodation for those in need. It was originally decreed that it should also feed up to one hundred poor people a day and although the site of the Hundred Men’s Hall where they once dined is now in use as a volunteer-run tea room, time was when travellers like those on the move just over the hill might well have stopped to rest and perhaps partake of the Wayfarer’s Dole – a horn of beer and a scrap of bread. Ask at the Porter’s Lodge and you shall still receive it today for the Hospital of St Cross remains a place of welcome, of shelter. Calm comes as standard, peace is the default setting. Visitors noticeably relax on entering the medieval inner quadrangle with the Tudor cloister to the left and the distinctive medieval almshouse to the right where the resident Brothers in their gowns and hats of black or claret appear not in the least incongruous. It is, after all, their home. 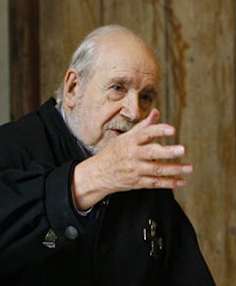 ‘I am intensely aware of the history here… I feel quite ancient too!’ laughs Brother John Hodges. He’s the Senior Brother, an unavoidable product of having lived here for 28 years, longer than any of his brethren. A former primary school teacher he’s 88 years old and as lively as his spirit and flesh will permit. In the 1950s and 1960s John used to bring his pupils as well as his own children to the hospital. He felt in tune with the place so, following a career move to Cornwall that resulted in the break up of his marriage, when he returned to Winchester to retire and found he couldn’t afford a property he applied to the hospital and in 1988 was admitted as a Brother. He’s a Brother of St Cross, the original foundation, and wears a black gown, black trencher hat and a silver Cross of Jerusalem, possibly from the crusading Knights Hospitaller who administered the hospital in the 12th century. 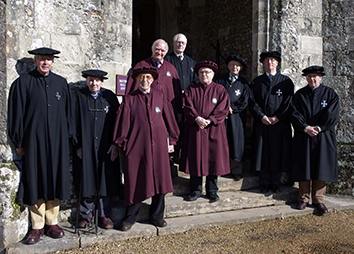 Brethren of the Order of Noble Poverty, founded in 1445 by Cardinal Henry Beaufort for noblemen who had fallen on hard times, wear claret gowns and hats and a silver Cardinal’s badge. ‘They’re the ones who had it then lost it, whereas we’re the ones who never had it in the first place,’ offers John by way of explanation. 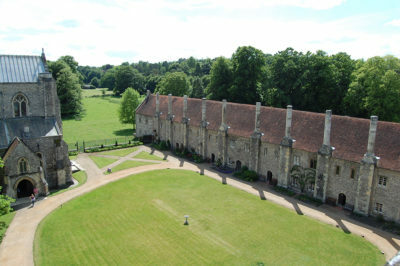 The hospital has warden-assisted accommodation for up to 25 Brothers in self-contained apartments built on Beaufort’s orders after his death in 1447. Each is typically let unfurnished and has its own sitting room, bedroom, kitchen, shower/wet room and separate WC. All Brothers pay a standard charge for heating and lighting – currently £45 a month – and those who have financial resources make a contribution based on their means and the technical rent value of their quarters. At the time of writing the hospital is full but there is no waiting list for vacancies. Brothers must be single, of retirement age and able to live independently as the hospital is not a nursing home. They are obliged to attend a matins service for 20 minutes every morning in the Church of St Cross, which is the hospital’s private chapel but unusually also serves as the parish church of St Faith’s. Otherwise they come and go as they please. As part of John’s role as Senior Brother is to interview prospective candidates and to guide new brethren through the admission process he’s quick to point out the way of life may not suit everyone. ‘This is a community and to be successful it needs everyone to contribute. For instance there’s no use grumbling that you can’t make friends if you’re not willing to make an effort to talk to people. It’s true that there is a structure of a sort, but in practice it’s quite flexible – for instance I’ve known a Roman Catholic brother who did his own thing on Sundays and going way back when they admitted married couples there was a husband and wife who were United Reformed Church. 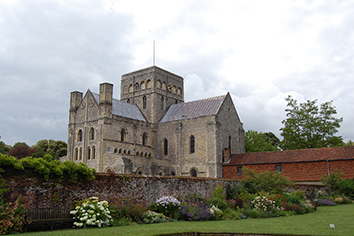 The story goes that Henri de Blois, papal legate, Bishop of Winchester, grandson of William the Conqueror and younger brother of King Stephen, founded the hospital after being stopped when out walking and begged for help by a milkmaid and her child on behalf of the starving villagers. Reminded of the Madonna and Child, Henri’s response was to build the hospital in the name of the Holy Cross on the site of an earlier religious house destroyed by the Danes. He appointed a Master to manage the enterprise and having survived all manner of fiscal skulduggery in the Middle Ages the position still stands – the name of the incumbent Revd Reg Sweet being added to the role of honour in the church when he took up the post in 1999. A memorial stone to an earlier Master, William Lewis, in the pavement of the chancel records his two terms of office – he was appointed in 1627 but replaced by future regicide John Lisle in 1644 only to be returned to the post in 1660 upon the Restoration of Charles II. In fact, Henry ordered the brethren to pray for the health of his queen, Anne Boleyn, in September 1535 only to execute her the following spring. Ironically, almost 500 years later, scenes showing Anne Boleyn at archery practice in the BBC adaptation of Wolf Hall, Hilary Mantel’s Booker Prize winning novel of the period, were filmed in the hospital’s beautifully appointed gardens. It transpires there’s no truth in the persistent local tale that the carved oak lectern was sawn in two and buried to prevent it falling into Puritan hands. The lectern – depicting a parrot’s head on an eagle’s body to remind us the word of the Lord should not be recited parrot fashion – in fact dates from the late 19th century and was probably delivered, if not flat-packed, then in at least two parts. Also in the church, a cross on a column in the north aisle is angled so that sunlight from the nearest window only falls on it on 3 May (the day of the Invention of the Cross in the traditional Church calendar) and 14 September (Holy Cross Day). ‘The Hospital of St Cross has been here for almost 900 years and its history is remarkable, but there’s room for all sorts of mischief and stories to be made up – I think we’re allowed a few quirks,’ smiles John, mischievously. For information about becoming a Brother or to request an application form please call 01962 878218. John Hodges was an English & amateur dramatics teacher in the prep school at the now defunct Truro Cathedral school in Cornwall which closed in July 1982 whereby i was a pupil of his from 1977-79. Copeland Court where he taught from is now named Epiphany House and is now a spiritual retreat and conference centre,having been a nunnery for 20 years from 1985. I belong to a closed facebook group dedicated to the old school and we have very fond memories of John’s teaching years there.We wish him well and send our best wishes to him & his family.